Round three of the 2012 Formula One World Championship, the UBS Chinese Grand Prix, takes place at the Shanghai International Circuit on Sunday 15 April. The 5.451 km Herman Tilke designed circuit made its debut on the calendar in 2004 and is shaped to represent the Chinese 'shang' character. 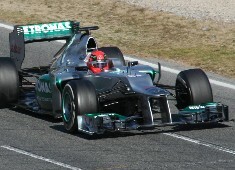 Michael Schumacher: "When I think about the Chinese Grand Prix, the fans are the first thing that comes to mind. For many years now, I've had a big and loyal fan base there, and it's still very touching to see the lengths they go to in supporting me. A big thank you to all of them! As for the race itself, I've never had much luck in Shanghai, apart from my win in 2006; however that could change this year. In the first two races of 2012, we didn't manage to maintain our qualifying pace in race conditions. We've been working intensively on this, so that we can offer our fans a strong performance in China." Nico Rosberg: "I have good memories of the Chinese Grand Prix as I was on the podium there in 2010 and led the race last year. I like the Shanghai International Circuit very much with its many unique, long corners. For me, China is really the start of the season as the first two races have not gone to plan. The track is quite different to the first two, as it demands more from the front tyres than the rears - in other words, what is termed a front-limited circuit. We know that we have a quick car, but we are looking to improve our long run pace in China next weekend and to have a better race performance." Ross Brawn, Team Principal: "The Chinese Grand Prix takes place at the very impressive Shanghai International Circuit and has really established itself on the Formula One calendar in recent years. China is an important and growing market for our sport, and indeed for Mercedes-Benz, and we look forward to our annual visit next week. On track, we hope that the weekend will prove more successful than the first two races of the season where our race results did not match expectations after a positive start to both weekends. A lot of hard work and analysis has taken place back at the factory since our return, and I hope to see these efforts pay dividends next Sunday in Shanghai with a performance which reflects the capabilities of the F1 W03." Norbert Haug, Vice-President, Mercedes-Benz Motorsport: "The first two races of the 2012 Formula One season have been ones of unfulfilled promise for our team. Michael's second row qualifying positions were less than half a second from pole in Australia and Malaysia, however at both events we did not convert our qualifying speed into a consistent race performance on Sunday when it counts. Since the last race in Malaysia, the team has conducted analysis of our tyre usage during the first two rounds, and how we can improve. The Chinese Grand Prix will provide an answer on our progress, although weather conditions and circuit characteristics will be different to either Melbourne or Malaysia. The 1170 metre back straight accounts for over 20% of the lap distance, the cars exceed 285 kph on four different occasions, and nine of the circuit's corners are considered to be low or medium speed, with five taken at less than 100 kph. Our team has been hard at work since Malaysia, and we hope to be able to translate our learning process into consistent and competitive lap times on race day in China."